o Analog TV with VHF/UHF antenna input.  Analog TV older model.  RF input for antenna/cable signals. Digital cable TV service is used to receive TV signals. 1. Connect a coaxial RF cable from the cable box RF out to the VCR antenna input. 2. Connect a coaxial RF cable from the RF output of the VCR to the TV antenna RF input. 3. Connect RCA A/V cables from cable box to A/V receiver inputs. 4. Connect a composite video cable from A/V receiver MONITOR out to TV. 5. 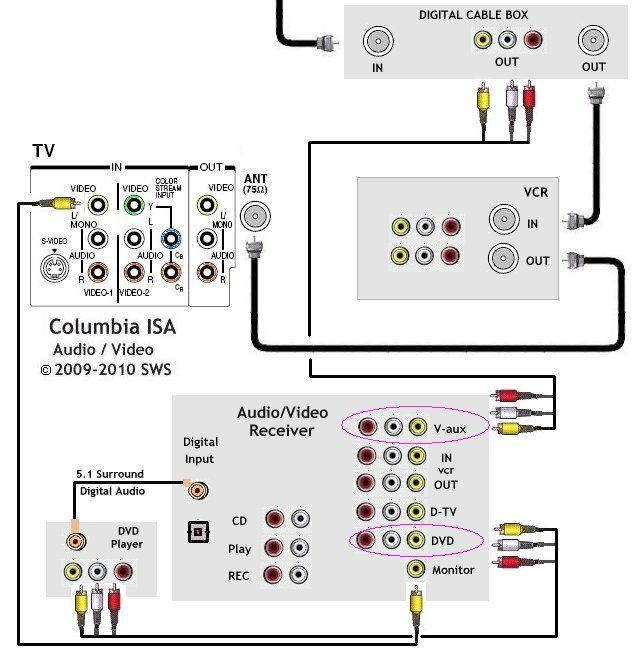 Connect RCA cables from DVD player to A/V receiver inputs. o To view analog and digital cable TV shows. o To record TV shows. o To listen to sound thru loudspeakers instead of TV speakers. Set VCR to record channel 3 (or 4). Set TV to channel 3 (or 4) or Video input. Tune channels on cable box.